We started catering when a customer of ours requested some of our dishes at a party they were throwing. 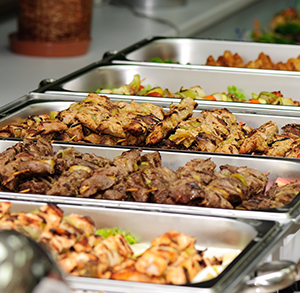 Simply by word of mouth our catering business has grown exceptionally well over the past few years. We have established a reputation of providing good quality food at a competitive price. We will deliver to your home or office for that special party, graduation, or office meeting. We will “cater” the menu to your needs. So, think of the 5th Quarter & Press Room Eatery next time you have that party or event where you would like delicious food with someone else doing all the work! !